T3 Becomes 2nd New Footwall Discovery and Drilling Continues to Intersect PGM’s from the Pine Zone at the River Valley Platinum Group Metals Project, Sudbury Mining District, Ontario. – New Age Metals Inc.
Borehole PL-17-06 intersects 22m of 1.51.g/t Pd+Pt+Au, including 10m at 2.58 g/t, and 3m of 3.95 g/t. T3 becomes 2nd footwall discovery with T4 to T9 earmarked for future footwall exploration (Figure 2). Updated NI 43-101 to commence upon the announcement of final assays. October 31st, 2017 Vancouver, Canada – New Age Metals Inc. (TSX.V: NAM; OTCQB: PAWEF; FSE: P7J.F) is pleased to announce the second batch of drill hole results from the 2017 drilling campaign. Drilling was focused on the T3 Zone and Pine Zone as a follow up of the 2015 and 2016 drilling at the River Valley PGM Deposit. The drill program is now complete and the company is waiting for the last batch of assays. Harry Barry, Chairman/CEO states. “The purpose of the 2017 summer/fall exploration program was to focus on the footwall mineralization and recent IP geophysical targets from the Pine Zone to T3 (figure 1). The footwall mineralization is a new model as opposed to the historical contact mineralization model where the bulk of the resource had been identified, giving us further confidence that the project can be developed into an open pit mining operation”. To date, 4 holes have been drilled in the T3 area which is approximately 1000m South from the top of the Pine Zone discovery. All 4 holes in the T3 area hit significant mineralization with borehole T3-17-04 (News Release September 20th, 2017) resulted in 28m of 2.45 g/t Pd+Pt+Au at 4m below surface, including 3m of 7.12 g/t. Within the same hole, mineralization was also intersected at 24m below surface with an additional 6m of 4.06 g/t Pd+Pt+Au, and at 37m below surface with another zone of 4m at 3.30 g/t. Upon completion of this program, further holes will be delineated for additional drilling on the T3 discovery as the results are reviewed. The new exploration model of footwall mineralization has yet to be tested further south of T3, between T3 and T9 (figure 1), and these targets equate to a small portion of the 16km of strike length of the main zone. Drilling of the T3 continues to show PGM (Pd+Pt+Au) mineralization in the footwall of the main River Valley PGM Deposit and therefore increasing the amount of known PGM mineralization in this new area. Drill results (Table 1) have confirmed continued PGM mineralization in the Pine Zone (footwall) of the main River Valley PGM Deposit. At present, PGM mineralization has been extended for approximately 140m east of the previous known PGM mineralization. From the Pine Zone to T3 equates to approximately ~1000m of strike of new mineralization. One exploration hole was completed to test a recent geophysical anomaly over the Banshee Zone which returned insignificant results. Six drill holes results were previously announced. Further re-interpretation of the geology, geophysics, structure and PGM mineralization on the project are ongoing with the company’s geological and geophysical consultants. Drill widths are considered not true width due to the exploratory nature of the drill campaign. To date an approximate 140,659m (461,480ft) in 628 holes have been conducted by the company and its past major joint venture partners to test the PGM mineralization of the River Valley PGM Deposit. Several 43-101 compliant resource estimates have previously been generated for the deposit through the development phases. The River Valley Deposit present resource, with approximately 3.9 PdEq ounces in Measured Plus Indicated mineral resources and near-surface mineralization covers over 16km of continuous strike length. NAM’s flagship project is its 100% owned River Valley PGM Project (NAM Website – River Valley Project) in the Sudbury Mining District of Northern Ontario (100 km east of Sudbury, Ontario). Presently the River Valley Project is Canada’s largest primary undeveloped PGM deposit with Measured + Indicated resources of 91 million tonnes @ 0.58 g/t Palladium, 0.22 g/t Platinum, 0.04 g/t Gold, at a cut-off grade of 0.8 g/t PdEq for 2,463,000 ounces PGM plus Gold. This equates to 3,942,910 PdEq ounces. The River Valley PGM-Copper-Nickel Sulphide mineralized zones remains open to expansion. 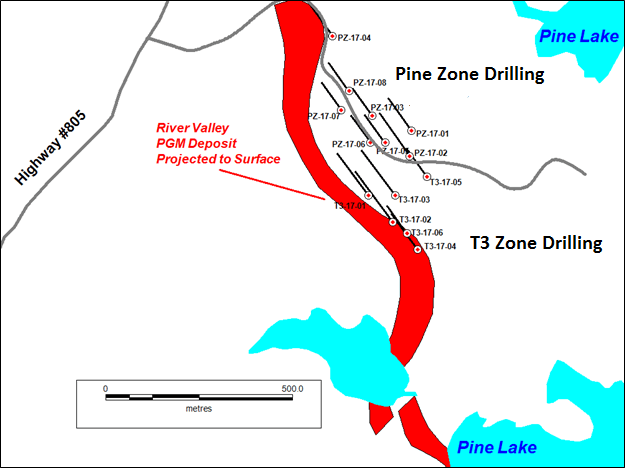 The company has recently completed a drill program on the Pine and T3 Zones.